We will soon be making a return visit to "The Great White North". Last year we had the opportunity to teach some classes at The Scrap Yard in Calgary for our good friend Lori Wilson-Bunda. This year she has asked us to return for a special event being held at this lovely resort. 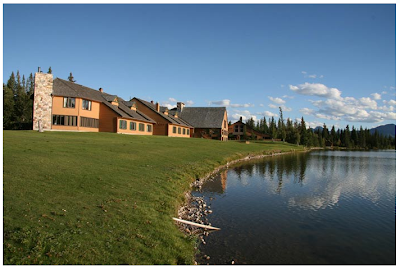 Nakoda Lodge, is nestled in the Canadian Rockies on beautiful lake Chief Hector. We are so excited, not only to get to go to this gorgeous place but to spend time with this fun lady as there will never be a dull moment. We have never seen anyone make a Charlie Chaplin moustache out of a scalloped metal paper edge (until now). Convenient that the metal paper edge comes with a sticky back. Although this picture doesn't show it, she had the matching eyebrows at some point during the class. Just to give you an idea of how colorful she is, check out her cool boots. We got to celebrate her birthday while we were there....it was great fun! 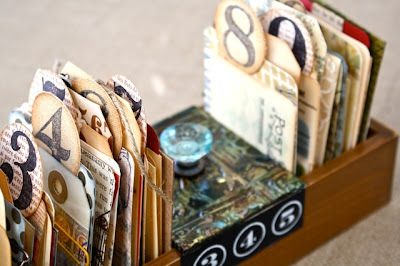 This new 7gypsies mini drawer has 10 numbered cards with journaling lines on the back to write out your own unique "TEN". It might be 10 things I love, 10 people I love, 10 places I have visited, 10 people who have inspired me, 10 Ways to Leave Your Lover (oops! sorry, that's a Paul Simon song and I am sure it is copyrighted, so we can't use it), but you get the drift, right? We will be using 7gypsies new paper line Lille in the 8 x 8 scale for inspiration in creating the cards with a bit of ephemera thrown in. We also will be using a whole 'lotta Ranger products from Perfect Pearls to the new Distress Stains in combination with Perfect Pearls Mists, just a bit of 10 Seconds Studios Metal and Alcohol Ink thrown in for good measure. 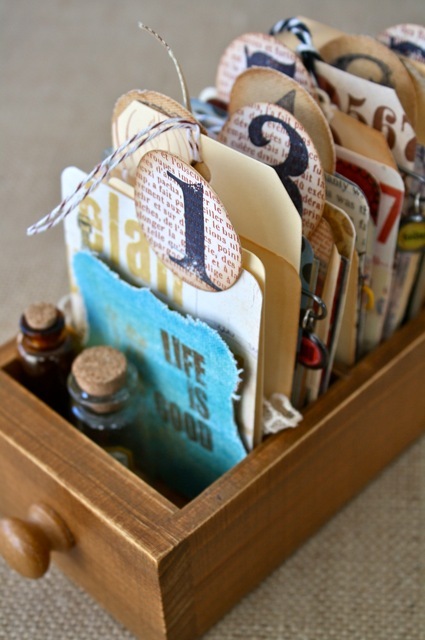 We will create enough cards and tags to fill the mini drawer with a bit of room left for photos representing your 10. 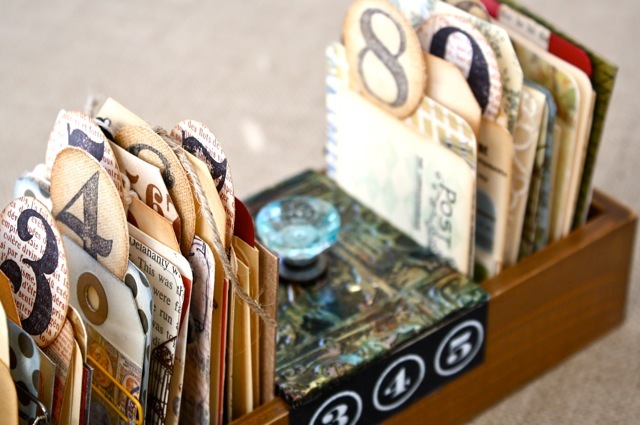 Each drawer will be unique, using words, numbers and initials you choose to make your own personal statement. You might also notice there are a few other scheduled stops coming up. Do you live a life of Abundance? We don’t mean dollars in the bank but plentifulness of the good things of life; family or friends...love and compassion. Celebrate what is good about your life right now by deconstructing a 7gypsies portfolio into what looks like a neat package, yet opens to reveal a “movable” feast of individual parts. Each fold of the stage opens to reveal hidden journaling spots, tiny pictures and eventually a small book for more introspection. Personalize your project with your own pictures, words and thoughts to make this project unique to you, a friend, or loved one. We will be working with 7gypsies new Lille paper, Collage tissue (fabulous) and Ranger’s new Distress Stains (can you tell we love this stuff?) So get ready to put on your apron, get your fingers dirty and celebrate the abundance of life. Oh, how I love this project! where we will teach both Abundance and My Ten (call for times). We have never taught in the Northern California so we are looking forward to meeting some new gypsy girls and maybe finding some fun things to do along the way. We may add a few more dates to the schedule for these classes so just keep watching (still finalizing dates). If you are not in the area where we are teaching, just email us and we will put you on a waiting list for extra kits if they become available. I like very much Simple Abundance too. Both of those classes look fabulous! I'll keep an eye out in case you every come over towards the west coast! These kits are both gorgeous! I love the new mini drawer. Sure wish you'd come to the east coast to teach some classes. Wish I lived much closer. Both kits are fabulous -- would be so fun to make these, so I'm certain that those attending will have a wonderfully creative time! Both of these new classes look wonderful! I would love to take a class with you two, I also wish you would come teach some of your classes on the east coast. Oh my gosh! I can hardly wait till you come to teach at the event at the Scrapyard, it will be sooooo much fun!!! Hey stop over in Las Vegas to do a class. I'm between AZ and CA! Let me know if there are any extra kits. Hello! My friends and signed up for your classes here in Brentwood! We are so excited and can't wait to meet you both and to take your classes! Where is Clovis?? I live in S.California and already have a commitment so can't come to your Brentwood class...sooooo bummmed. Please put me on a wait list for the abundance kit....maybe my 10 to. Depends on the cost. You are so VERY talented. I just love coming to your blog for inspiration!!! !